I LOVE Houmous! There is often nothing better than a big bowl of houmous with warm pita breads and crunchy coloured peppers, but there is one thing that confuses me about it and that’s the name; is it houmous or hummus? I usually rely on my trusted google dictionary to clear up my often incorrect spelling or pronunciation of foods but it appears that both spellings are correct, or am I going mad?! Is houmous vs hummus simply the classic English vs US dictionary, or is there another explanation to it? Can anyone out there help me clear this up once and for all and put me out of my houmous (or hummus) misery?! Those of you that (quite rightly) just don’t care about the spelling, you will be able to enjoy this for what it is; quick, easy and delicious munch! Enjoy it as a healthy snack, a lunch box filler, great addition to a sandwich or a great accompaniment yesterday’s roast chicken recipe. I love sun dried tomatoes! Will definitely have to try this next time my sister-in-law comes over. Thanks for sharing! Yum! I love Hummus too!! Nice site! 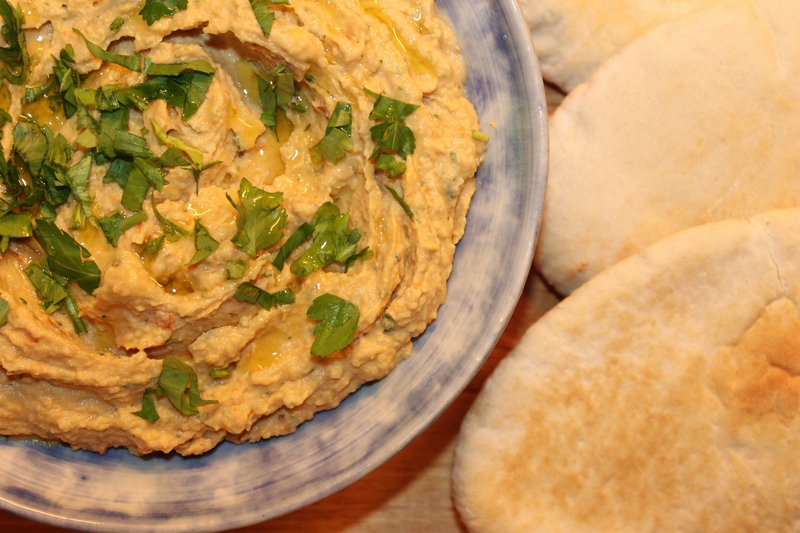 Here’s a quick hummus recipe ( Yep, I’m still fixated on snacking.) I have made hummus without the tahini when I was out of it. I’ve also used lime in place of lemons. I experiment with whatever I have on hand if it’s a flavor I like. Why not add sundried tomato?! Excellent, can’t wait to try it! Great veggie snack, I’ll try this one this evening!